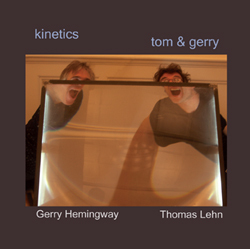 The duo now offers a third recording on Auricle Records from performances in 2003 and 2005 entitled "kinetics"
One of Hemingway’s most effective liaisons has been his duo with analogue synthesizer specialist, Thomas Lehn. Kinetics (2) is their third release. What’s most impressive about this duo is their dynamic range. While much of this hovers quite effectively aroundthe quieter end of the spectrum, it only serves to heighten the louder passages. And the apocalyptic climax to the epic (over 31 minutes, the remaining tracks are edits in the 4-10 minute range) final track with Hemingway dropping literal bombs with his drum kit is almost frightening. But through most of this Hemingway is using cymbals and smaller percussion instruments, scraping, tapping, and bowing in an acoustic counterpoint to Lehn’s alien electronic sounds. At an hour, this is a perfect distillation of what these two do. And they do it well. Kinetics makes a very persuasive case for the virtues of good recording, thoughtful post-production, and musical maturation. Which isn’t to say that Tom & Gerry’s previous efforts for Erstwhile and Umbrella were bad records; in particular, their self-titled debut presented a thrilling exchange of electronic and acoustic sounds in real time. But this one, which is on Hemingway’s own, is even better. One reason is the audio quality, which fully realizes the tactile sensation of Lehn’s analogue synthesizer playing and satisfyingly recreates the vibrations of air molecules around Hemingway’s cymbal strokes. You’ll lose some of the music if you run Kinetics via itty-bitty wires into tiny speakers; this baby demands to be played on a decent stereo system with speakers of a certain size. The same care that got the most out of self-recorded live performances also, I suspect, went into picking the right ones; there’s not a wasted second on this CD. Hemingway and Lehn sustain enormous and unwavering control throughout, even in long moments near the silence threshold. This is the duo’s quietest album; they dole out the fireworks as sparingly as a fire marshal in woodworking class. If the double-disc Tim & Gerry gave us a bit too much, this one gives us only the right stuff. Of course that stuff had to be there in the first place, and that’s where the refined attunement that comes from working together, pushing forward, and having the chops and chemistry to get where you need to go comes in. Non c'è dubbio che Gerry Hemingway sia un batterista che invoglia al dialogo: lo fa all'interno di formazioni allargate, lo fa con una sensibilità ancora più sottile quando si trova vis-à-vis con altri musicisti che condividono la medesima spinta all'esplorazione. Accade - è il terzo disco ormai per la coppia - con il sintetizzatore analogico di Thomas Lehn, artista che ha scelto uno strumento apparentemente poco al passo con i tempi per provare a spostare i confini del mondo sonoro conosciuto. Le cinque improvvisazioni di questo Kinetics [le prime quattro contenute tra i tre e i dieci minuti, l'ultima dilatata oltre la mezz'ora] sono state catturate in diverse occasioni live, in Austria, Germania e Francia, ma i due musicisti hanno anche lavorato sodo in postproduzione per rendere l'esperienza sonica più idonea all'ascolto casalingo [modalità, a parere di chi scrive, che difficilmente restituisce la molteplicità di piani estetici del momento performativo]. Ne viene fuori un lavoro dettagliatissimo e intrigante, fatto per due terzi di suoni molti lievi, di fruscii e sussurri, di fischi e di impercettibili spostamenti uditivi, di soffi e di scricchiolii, quasi a sondare la grana della materia. Quando poi, nella parte conclusiva della lunga "Maquette" [che si apre con cadenze misteriose e ieratiche], i due danno sfogo a un ribollire di energie quasi primitivo, la musica sembra debordare da ogni parte e diventa uno sconvolgente incendio dei sensi. gh (at) gerryhemingway (dot) com"
For the past twenty years or so, drummer/percussionist Gerry Hemingway has shown himself to be a willing participant in any creative situation. His discography contains all sorts of unusual collaborations. 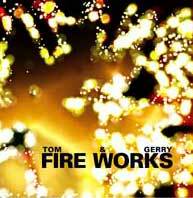 But Tom & Gerry, done in collaboration with German synthesizer player Thomas Lehn is among the most unusual. Lehn hails from Cologne and his equipment consists only of analogue synthesizers. Cologne was the center for Stockhausen's early electronic experiments so one wonders if Lehn's attraction to these now largely unused instruments stems from some early unconscious environmental experience. Was electronic music always in the air (or water) in Cologne when he was younger? Whatever the motivation, Lehn's command of these notoriously difficult instruments is impressive (even more so in concert). The thirteen tracks on this double disc are edited highlights of a tour but they all have the feel of complete entities. "With the release of Erstwhile 004, Abbey provided the first substantial (and accessible) recording of analog-synth player Thomas Lehn. Tom & Gerry, a phenomenal pairing of the widely regarded but rarely recorded Lehn with premier percussionist Gerry Hemingway, is an indispensable document. 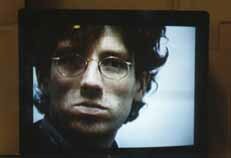 Lehn, a key player in Keith Rowe's all-star Movement in Music Electronic Orchestra (MIMEO) and an important figure among electro-acoustic improvisers, differs from many of his contemporaries in that he often uses the synth as a discrete instrument. Whereas other improvisers tend to intertwine electronics and acoustics, Lehn's instrumental voice stands apart in its disciplined yet exceptionally expressive articulation." The American-German Duo of Gerry Hemingway and Thomas Lehn gave a special concert in the series "Unheard in the Neuen reformierten Kirche [New Reformed Church]. Both artists offered a program of largely improvised music that revealed significant references to the tone creations of Karlheinz Stockhausen from the 50's. At that time, he experimented and composed on the basis of synthetic sound production with electronic tone sources. That the possibilities of creating tones in this manner have no bounds was proven by Thomas Lehn with his analogue synthesizer. This instrument's unbelievable spectrum of sound and static from a simple sinus tone to colorful noises made for an exciting combination with the dynamically highly sophisticated percussion performance of Gerry Hemingway. This combination allowed both artists to build large tensioned arcs and bizarre sound structures (impulse sequences, static), which were skillfully and convincingly resolved in the end. Both musicians complemented each other superbly, whereas on the surface Gerry Hemingway acted a little reservedly. In contrast, Lehn "processed his analogue synthesizer as if in a rage with impressive facial play and gestures, and exactly this connection of the optic and acoustical impressions made up the appeal of this music. Hemingways eine reizvolle Kombination. Sie ermoeglichte es den Kuenstlern, in jedem der Stuecke grosse Spannungsboegen und bizarre Klangstrukturen (Impulssequenzen, Rauschen) aufzubauen, die zum Ende hin sehr gekonnt und einleuchtend wieder aufgeloest wurden. Beide Musiker ergaenzten sich vortrefflich, wobei Gerry Hemingway aeusserlich meist ein wenig zurueckhaltender agierte. Lehn hingegen "bearbeitet" seinen Analogsynthesizer wie entfesselt mit beeindruckender Mimik und Gestik, und gerade die Verbindung von optischen und akustischen Eindruecken machte den Reiz dieser Musik aus.